Rating: 5/5 – The Best This Run of Justice League Has Ever Been! When Bob talked about July’s Diamond Sales, one of the surprises that stood out to me was Justice League not making the Top 10 in books sold. Justice League, especially with Jason Fabok on the art has been nothing short of exceptional. While Marvel’s Secret War books like Age of Apocalypse and Guardians of Knowhere were good (ranked 9 and 10), Justice League’s Darkseid War storyline is the best the book has been in both story and art and that’s saying something since I’ve really enjoyed this book since issue number one. 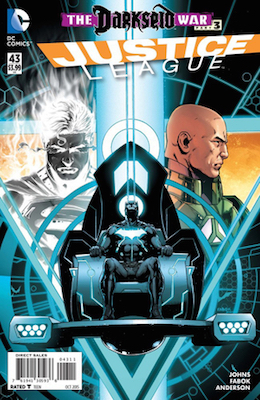 In part three of The Darkseid War, Kalibak steps into the picture, Superman and Lex’s relationship takes an odd turn, and Batman has become a god. This issue is packed with story and you definitely get your money’s worth. Writer Geoff Johns does a wonderful job of throwing so much story into this issue without it ever feeling overwhelming. Not only do we get the Justice League, but we also get the New Gods, Darkseid’s daughter Grail, and more. Of course there’s John’s great character moments, especially during a scene where Superman and Lex are trying to survive on Apokolips, and another that adds some humor to the book between Wonder Woman and Captain Marvel. These scenes capture so much of the character in one or two panels and Johns is a master at it. As strong as the story is, the art by Jason Fabok steals the show. Kalibak’s introduction is both violent and powerful and I can’t wait to see him battle the rest of the League. Darkseid and the Anti-Monitor are both drawn as menacing as they should be, and every single panel in the book is packed with details. Fabok gives the nod to Kirby’s work as well like Kaliban’s sash decorated with a circle and line pattern, Boom Tubes throughout, and of course the Kirby dots. It’s tough to find anything to critique in this issue when it comes to the art as Fabok is proving why he was given the job to draw DC’s premiere team. It really is surprising that this book isn’t cracking the Top 10 in sales, but I expect that to change the longer Fabok stays on this book. This continues to be one of my favorite monthly titles due to the strong balance of great storytelling and beautiful art. This story continues to get better with each issue, and the conclusion of this one points to even bigger things ahead! If you’ve stepped away from Justice League, now is the time to come on back. This entry was posted in DC and tagged Anti-Monitor, comic books, comics, Darkseid, DC Comics, Geoff Johns, Jason Fabok, Justice Leage. Bookmark the permalink.